Ding ding ding! There's a fire in town! 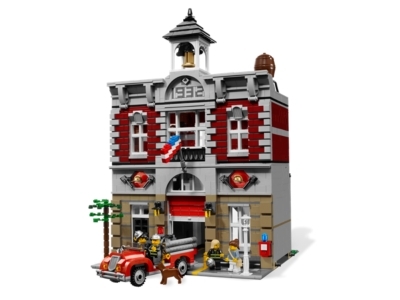 The fire brigade drives to the scene from this detailed and realistic 1930s fire station. Designed to fit with other modular buildings like #10182 Café Corner and #10185 Green Grocer, the station is built with rare LEGO pieces and innovative construction techniques. It includes a '30s-style fire truck, four minifigures and a fire-dog, an opening station garage door and removable building roof for interior access, and two fully-furnished floors featuring fire-fighting tools, racks for the firemen's helmets, a fire-pole, a ping-pong table, a kitchen with fully-stocked fridge, a couch and bookshelf, and a roof with a water tower and bell. Measures 35 cm (14 in) high and 25 cm (10 in) wide. Ages 16+. 2,231 pieces. Price is 213% above the initial Lego retail price! This comes down to 21.06 cent per brick. The Fire Brigade (10197) Lego set is no longer directly available from the sites below. However, 3rd party partners of these sites might still have the set available.